Oral pemphigus: optimization of diagnosis and complex treatment. 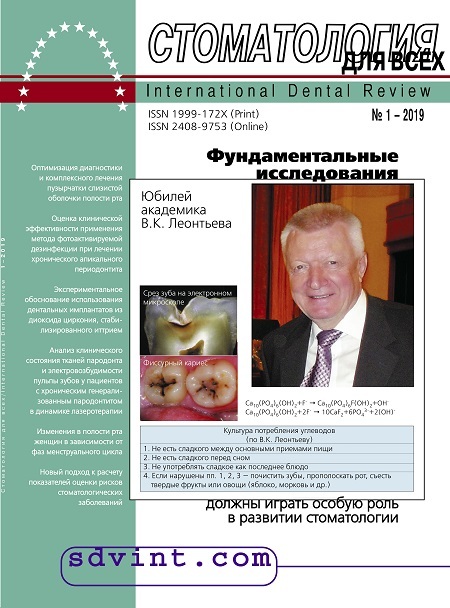 Fundamental research should play a special role in the development of dentistry. Experimental justifi-cation for the use of yttria stabilized zirconia dental im-plants dioxide with. Periodontal tissue clinical state and electric pulp response in patients with chronic generalized periodontitis: a follow-up analysis during laser therapy.Intraoperative maxilla and mandible positioning techniques in orthognatic surgery. Part 2. Menstrual cycle phase-related oral cavity changes in women. New approach to the calculation of dental disease risk indicators.